I had to redraw Lance to display the alter ego, "Balancho" in the same image since that's a huge part of his character. 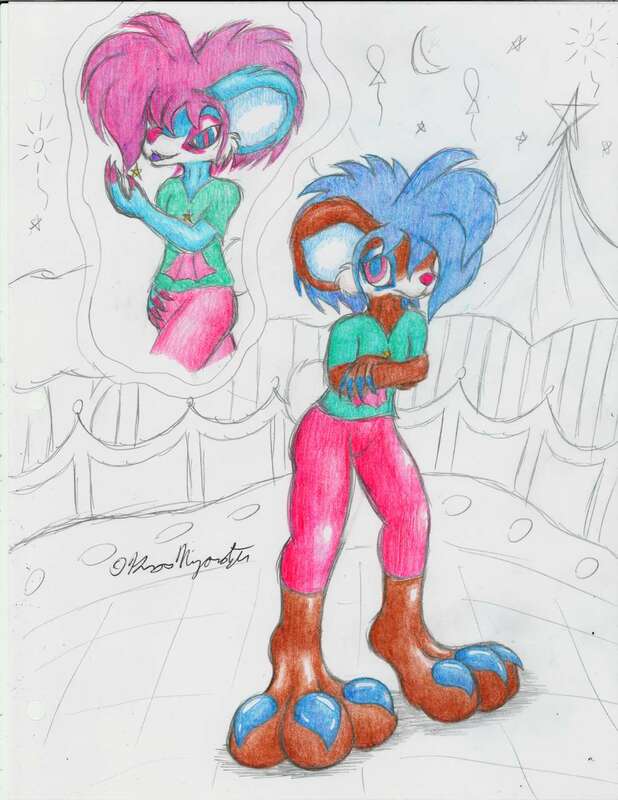 When a sign fell on his head that Bimmy knocked down after power returned to his Carnival, the electric surge and impact caused his alter ego to no longer be just an act he performs in the Big top, but now a full fledged alternate personality that randomly pops up. While it seems to have a mind of it's own as it completely changes his personality from calm, friendly and somewhat timid to dominant, mysterious and somewhat vain, they're still the same person and both personas actively are aware of the other's existence as themselves. Lance's fear of the other persona isn't the persona itself, but the fact that he can't control when he transforms. 1. The reason his alter ego is named "Balancho" is because apparently in Italian, Balanceo is pronounced "Balancho". I actually didn't know that and always pronounced it "Balan-see-oh". So I gave his alter ego's persona a more Italian name to reflect that. 2. The alter ego's voice is a lot deeper and more whispery than Lance's normal voice. Lance does have an italian accent and his voice is somewhat high pitched. Formerly Balancho was meant to speak entirely italian, but I changed it so he just speaks english but more like an evil magician cause I'm trying to remove all references to Earth. Despite that, by coincidence in the story, I still want Lance to have an Italian accent. 3. Lance is the son of the owner of Balanceo Carnival, Aerice, He does look like he's wearing clown make up, but he's not. The only thing unnatural about his look is his bright red nose, but even then, he uses his electric element combined with the coldish air to make it look red. His hair is also naturally blue despite looking like a wig. 5. While the transformation is canonically random (it's more likely to happen when Lance is stressed, but usually both forms last for awhile), in the game where he's playable, it does activate on specific conditions: If you're attacked, if you combo an attack enough times, or if you do a chain of commands like jumping several times in a row. While in Balancho form, his movements are automatic as you move through certain areas, but he is immune to damage and will always perfectly traverse complex areas. He reverts back after a short while or by standing still for a few seconds. 6. Just wanted to stress, Balancho is not a different person. He's more akin to an extreme mood swing. If you ask normal Lance what he did as Balancho, he will be able to explain everything as if it was all intentional. and similar for asking Balancho what he did as Lance. The only thing about the shift is that it's such an extreme shift that it seems beyond control for Lance and that's the part that scares him. Being in the form though, he's perfectly fine with the form itself. Just that he can no longer control when it activates. 7. His name is Lance cause "BaLANCE". His last name is misspelled intentionally.